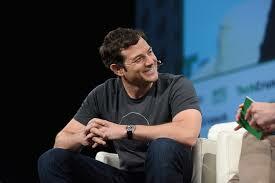 When you think of the giants of Silicon Valley, Pinterest may not immediately spring to mind. But with 200 million active users and a recent valuation of $12.3bn (£9bn), the platform that started out in 2012 as a quirky online scrapbook has quietly become a hot commodity for advertisers and investors alike. Perhaps that's why Pinterest president Tim Kendall chooses to keep his cool with a daily ice bath. Zoe Kleinman: Is it true that you have an ice bath every morning? Tim Kendall: I now have a freezer on my back deck that I put water into, and now I get into that because the bath with ice wasn't quite cold enough. So, it continues to escalate. It's like people having coffee in the morning. It's a slightly more extreme version of that. It gives me a lot of energy, wakes me up, resets my mind and my body. Our days are long and intense and I find that if I do it I feel better throughout the day. My children love it. They like to talk to me while I'm in it, they ask how much it hurts, they dip their fingers in and then shake and say "Argh, it's so cold!" They're pretty entertained by it but I don't know how long that's going to last. I do ask them every once in a while, "Hey, do you want to get in?" And they are very clear that they do not want to get in it. ZK: You are renowned for always wearing a T-shirt with the word "Focus" on it. You're wearing one today - what's that about? TK: It's a shirt that I've been wearing for almost five years. It's not the same shirt but it says the same word on it. It started as a bet with a colleague of mine, seeing who could wear the shirt for longer. He and I kept wearing it and eventually I kept wearing it longer. The whole point is that we philosophically think that if you do fewer things, you can do those fewer things much better than if you are spread across too many things. It's important that we remind ourselves of that. Sometimes I'm not great at focusing but if I put this shirt on every day, in a small part it reminds me that I need to stay focused and remember to say "No" a lot, which I think most people - including myself - are not great at. ZK: You don't allow laptops or mobile phones in meetings. Isn't that unusual for a tech boss? TK: I don't stick to my own rules as much as I like to. I think that in my experience, if you're having a meeting there's probably important information - hopefully. If it was set up thoughtfully, the right people are in it and the agenda is right, it should be content you should be paying attention to and if you're on your phone or on your laptop you are definitely not paying attention to it. I've been in meetings where I've been on my laptop and I've missed critical information that I needed to hear, so we try to make it somewhat informal but a bit of a rule that we try to to follow, so we're all engaged with each other. When you leave the meeting, get back on your laptop, get back on your phone. But when you're in the meeting, be in the meeting.